Eighteen years ago, Arab Chicago, led by a primarily conservative leadership, erroneously chose to back the “Compassionate Conservative” George Bush. Not only did the conservative Arab community believe that Republicans more effectively represented their core values, they also believed that an Evangelical Neo-Conservative Christian like George Bush would deal more fairly with the Arab and Muslim world than the Democratic nominee Al Gore, an Evangelical Neo-Liberal Christian (with an Orthodox Jewish running mate). It seemed that on foreign policy, the two parties were really one and the same. So, Arab Chicago backed the candidate that represented their own personal beliefs. Nearly two decades later, we are dealing with the aftershock of a genocidal decade-and-a-half-long war in Iraq. Our civil liberties have eroded to a mere footnote, a punchline in a dark comedy. The last eighteen years should have galvanized us, made us a solid voting force. Yet, as a community, we are ever more splintered. This primary season, the seat for the Third Congressional District in Illinois was up for grabs. 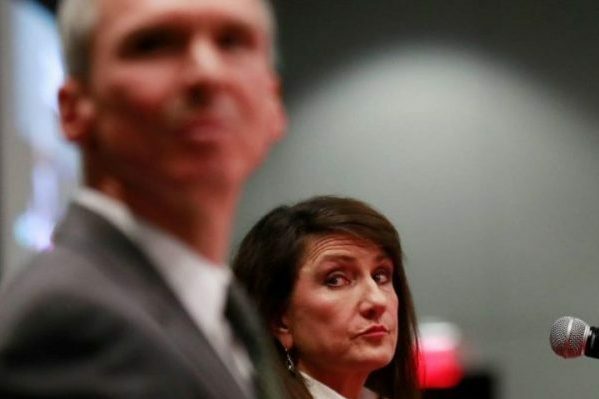 Representative Daniel Lipinski (D), long called a Conservative Democrat, faced a strong contender for his seat, Marie Newman. Lipinski’s antipathy toward his Arab and Muslim constituents is well-known. AAI compiled a scorecard of Lipinski’s anti-Arab, anti-immigrant, and anti-Palestinian votes. Surprisingly, in a community that is anywhere between 25-30% Arab and Muslim, Lipinski is overwhelmingly pro-Israel, and his bias shows in his voting record. Voting Marie Newman should have been a no-brainer for this community. She not only personally supported our fight against local township bigotry (Palos Township Trustee Sharon Brannigan), but she actively courted our participation in her campaign. It was a beautifully run grassroots initiative: “We are all running together,” she said, and she meant it. Not only did she invite our community to participate in her campaign, and listened to our concerns, she also eschewed AIPAC money. She refused to be ruled by outside sources. Newman ran a campaign based on inclusivity and community. Arab and Muslim women led our community to the water, but unfortunately, we refused to drink. A week before the election, AADC (Arab American Democratic Club) released their voting card to members. Astoundingly, they chose to support Dan Lipinski against a candidate that better suited our community. When asked for clarification, they closed ranks and refused to answer questions. In a very tribal act, they expected the community to simply listen to their sage advice, refusing to justify it. Conservative media pundit Ray Hanania penned a rather long article in support of Lipinski, despite his own biased Republican posture. The day before the election, a group of well-connected and well-established men and women—an old guard of professionals that lent their name to the establishment of many of Arab and Muslim Chicago’s foundations and mosques—put out their own plea in support of Lipinski. In the letter, they enumerated a list of reasons to support Lipinski. This time, there was absolutely no time to discuss the matter with them. This group essentially made a decision, and expected the community to follow their command without hesitation. In the end, the cumulative self-sabotaging efforts of this group of notaries and the AADC had ensured that another avowed Zionist remains in office. Marie Newman lost by less than two thousand votes. This time, it is clear that the Arab and Muslim American community leadership knowingly damaged its community. So I ask: Why do we keep sabotaging ourselves? Why do our leaders ignore the needs of its community? In the letter, we were told that we will never have a perfect candidate that represented all our needs. Perhaps. This is definitely the case in regards to the leadership within our own Arab and Muslim community. However, for once, we had the opportunity to elect someone who supported many of our issues from immigration to Palestine. This was our lark. This was our moment in the sun. And we decided to run into the shade. In November, we face an 3rd Congressional District election between Republican Arthur Jones (a confessed Nazi sympathizer and Holocaust Denier) and Democrat Daniel Lipinski, who hates Arabs and Muslims so much he voted to withhold money from the UN until they retract condemnation of Israeli war crimes. Vote for the guy who unapologetically hates everyone, or the guy who just hates me and my people? We will be choosing between which candidate professes the least caustic type of hate. Unfortunately, either way, it will be someone who supports the continued dispossession of Arabs and Muslims, the continued destruction of our land, and the continued criminalization of Arab and Muslim immigrants. Arab Chicago: We need new leadership. We need leaders that represent the diversity in our community. We are no longer a monolith of conservative think. Many of us are educated, secular, and demand more accountability. We may have to weather this storm for the next two years, but we will not let this happen again. Old Guard: Yislamoo Ideekum, for all you have done. But it’s time to move aside. I just tried to leave a comment but it wouldn’t go through. It said the Captcha was done in error without showing the Captcha (?!). Abe Lincoln was a bloody dictator and showed no mercy to those who opposed to him. Big brother loved and adored Abe and still does and wants us to adore Abe too. The MSM is the fourth branch of the US government. To my dear Muslim brothers and sisters, trust God. All else is fickle shaky ground including political ground. It will get worse before it gets better. You have your dignity. More precious than gold. Big Brother can never take that from you.